Each vinyl strap chaise lounge from A&K Enterprise of Manatee, Inc. has an aluminum frame that is sandblasted & powder-coated for a lasting and beautiful finish. All of our strap chaise lounge chairs are stackable. Our chaise lounge chairs are made in a variety of seat heights, including 12-inch, 14-inch, 16-inch, 20-inch. 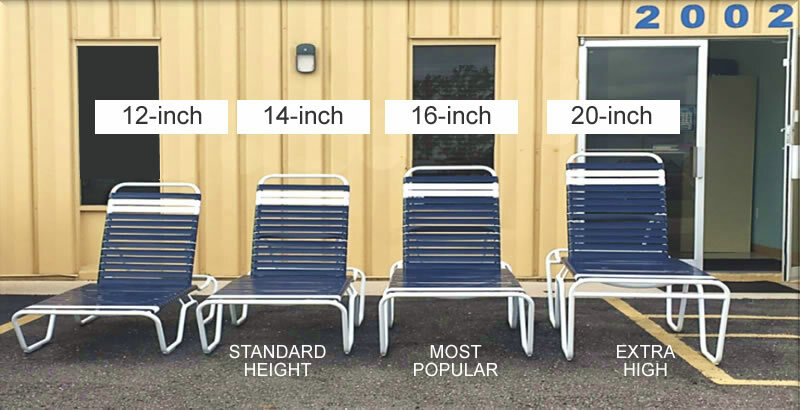 Click to see different seat heights. Each vinyl strap lounger is made-to-order in any frame color and strap combo. Customize your outdoor chaise with a broad array of colors to match your other outdoor strap chairs, including white, black, and a variety of greys, blues, browns, and greens. Each strap chaise lounge is commercial grade but also suitable for residential use. Our outdoor chaises feature vinyl strapping that is 2 inches wide, double-wrapped, and attached with a solid-shank nylon rivet. As the manufacturer, we offer factory direct discount pricing on our poolside lounge chairs. 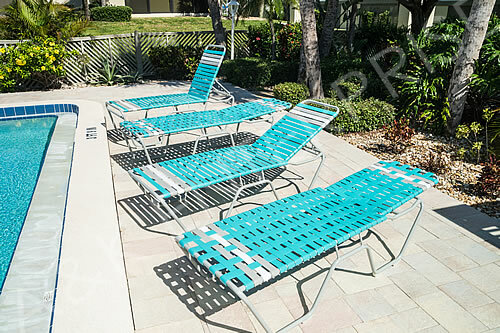 Most of our strap chaise lounges feature a solid aluminum skid plate to protect the aluminum frame on a concrete pool deck but have the option of a nylon super glide for softer surfaces, such as pavers. Our poolside lounge chairs are made in the USA and come with a commercial warranty!